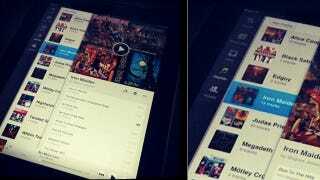 Is This a Peek at Spotify's iPad App? Looking like a cross between the Twitter iPad app and the iPad's new-but-not-so-great Music app, this pic might just show Spotify's first iPad app. Like the Panasonic GF5 camera, it was leaked on Instragram - the latest rumour-mill, evidently.